IST provides all the services necessary to characterize site soils, soil vapor, groundwater, surface water, biota, and air. Using its field sampling capabilities, IST has developed an comprehensive approach to rapid site characterization. This technology has the added advantages of easy mobilization and eliminating cuttings that require expensive and inconvenient handling and disposal. As samples are retrieved, they can be analyzed in the field using gas chromatography, colorimetric test kits, x-ray fluorescence (metals), or immunoassay test kits to generate data in real time. The data thus generated in the field are then used to further guide the assessment. For example, the results of a soil-vapor survey can guide the eventual placement of soil borings and monitoring wells. This flexible and adaptable approach can be modified to fit the needs of any project or client. In addition to the DSA, IST can also perform more conventional site assessments- drilling borings and installing monitoring wells. 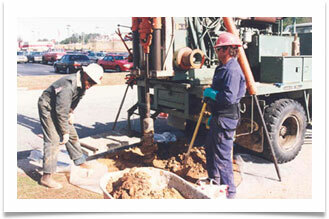 The firm also conducts aquifer characterization using pumping tests and aquifer tests. All subsurface investigations are carried out under the supervision of a registered professional geologist or engineer. This dynamic real-time comprehensive site assessment (DSA) methodology integrates three survey types: soil-vapor, soil, and groundwater sampling. All three environmental media, or any combination thereof, are sampled using direct-push technology.